If Mayweather won’t fight Manny Pacquiao, who would you want the “Pacman” fight next? Many things have been said about the failed attempts to bring the two top pound-for-pound boxers in the same ring to what might have been the fight of the decade, some say even century. Unbeaten Mayweather vs. P4P king Pacquiao. Who wouldn’t want to see that? Well the last ditch drive to make it happen had hit a brick wall, and Team Pacquiao decided to move on. Regardless whether the last negotiation ever took place, you’ve got to hand it to Manny’s camp, as they have announced to the world that they are willing to fight. And so, for Manny’s last fight before he retires, Margarito’s name came about. Top Rank Promoter Bob Arum explained why he chose Margarito over the Puerto Rican Miguel Cotto. He said, he made the choice because it would be perceived as a more competitive bout. Since it was announced that Manny Pacquiao’s next fight would come against Antonio Margarito, many fight fans have been quick to criticize just about every aspect of the event. Some boxing fans immediately made their disapproval known online with some even encouraging others to boycott the fight. Many don’t believe Margarito deserves to be facing Pacquiao after his suspension, subsequent refusal to admit any guilt over the matter or recent performances. 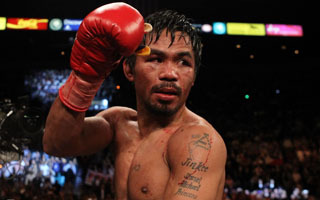 So if not Margarito, and Mayweather now out of the contention, who do you think should the Pacman fight next? While Floyd Mayweather is having his vacation, Philippine boxing superstar Manny Pacquiao on Tuesday delivered his first privilege speech as a member of the House of Representatives of the Republic of the Philippines. Representing Sarangani province, the pound-for-pound king laid out his plans for his constituents. Included in his programs and projects would be the focus on livelihood, health, sports and education. Mega-Fight gets KO’ed: Pacquiao – Mayweather fight officially dead ? For now, it may appear to be the case. Drug testing seems to be the KO punch for the fight of Manny Pacquiao and Floyd Mayweather Jr. Tentatively scheduled for March 13 at the MGM Grand in Las Vegas, the fight was to have been on HBO PPV, a sure blockbuster many believed would break the all-time pay-per-view record of 2.44 million buys set by Mayweather’s 2007 fight with Oscar De La Hoya. A last-ditch attempt at mediation between Top Rank and Golden Boy, which represents Mayweather, failed to reconcile the two parties’ opinion on the drug-testing protocol. Arum plans on moving forward with Pacquiao facing Foreman, who won his 154-pound title on the Nov. 14 undercard of Pacquiao’s 12th-round knockout of Miguel Cotto to win a welterweight belt. Pacquiao would move up in weight to try to win a title in his eighth division. Mayweather meanwhile, may be potentially fighting against former junior welterweight champ Paulie Malignaggi. Boxing fans who have been following the on-off-on again-off again developments of this whole drama are still hoping though, that in the end the two top pound-for-pound best boxers will finally settle everything in the ring. I’ll keep my fingers crossed. How about you?